Potent and provocative – one would expect nothing less when breathing fresh blood into one of the most famous tragedies of the early civilisations. 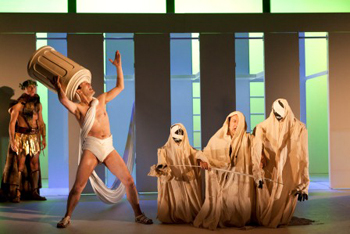 The offbeat European quartet Spymonkey comprised of Stephen Kreiss, Toby Park, Aitor Basauri and Petra Massey, and their collaboration with Kneehigh's Director Emma Rice and writer Carl Grose have given Sophacles' Oedipus a literal rebirth through the medium of comedic farce and physical theatre. Teetering on the edge of the absurd as most tragedies do, the extra stride taken by this little performance throws Spymonkey head, breast and heels first into the depths of the conceptually uncanny. Oedipussy is a 'tragicomedy'. If I'm honest its quite unlike anything I've seen before and what a rib ticklingly terrific experience. The menagerie of mayhem incorporated all the very best of the conventions at the heart of British comedy and pop culture. We were served up a delicate smattering of smuttery in the footsteps of Carry On capers; imaginative interpretations of travel, dances, anecdotes and slipping of wigs that the Monty Python boys, Morecambe and Wise and the two Ronnies would tip their metaphorical hats to; alongside the sultry Jocasta and Sphinx bringing a taste of Austin Powers to the mix and even elements reminiscent of The Mighty Boosh, oh and not to forget the 70's spandex influence of Bowie-esque solos and costume. Sound interesting?! I've not even got to the unicycle riding pederast King, the yet untold back story of Chrisipus or the Cirque du Soleil inspired Oracle at Delphi, I kid you not! To catch this roller coaster of a retelling at the Liverpool Playhouse, the only surviving working theatre in Merseyside from the Victorian Era was a real treat indeed. Just like the transformation the story underwent to bring the ancient alive through modern references, the Playhouse does much the same as it stands proud and tall in the middle of Williamson Square. The exterior of the Grade II listed Grecian style building boasts beautifully symmetrical pillars, balconies, pediment, cornices and Corinthian pilasters – the perfect venue for a Greek Classic! As it sits in all its beautiful and ornate abstraction next to the 1968 glass barrelled addition, I take a moment to appreciate just how this cylindrical wonder manages to balance quite so elegantly, in structural terms and aesthetically against its elder counterpart. Inside is just as suited to the show. Under the dark turquoise & gold detailed proscenium arch of the theatre stage, a structure of 6 white pillars representing the columns of ancient Greece sits for the performance thanks to set designer Michael Vale. These pillared fascias made from light weight and therefore moveable wood sit against a white metal framework structure of steps, temporarily hiding them from view. The performance once it commences does so upon, between and around the veritable climbing frame which is the anchor for focus on stage, quite literally infact as some of the costumes – namely the ravelling and unravelling togas are attached to it which provide for wonderfully farcical shenanigans throughout. This provides, in very practical terms, a multifaceted and variable level performance space which the cast use in every manner conceivable. The show opens with the cast playing themselves, 'in character', around one of the only other major stage props of the production, a white table with Oedipussy written across the top in blue. Introductions are made within the context of a meeting to discuss a critical review of the performance which is yet to be played out. The tone is self deprecating and tumultuous with members arguing and asserting their authority and personalities, of which we catch glimpses of repeatedly throughout the performance. So whilst the audience is presented with a farcical theatrical comedy as a whole they are also privy to the 'in jokes' shared between the actors during it. Bearing in mind this whole performance has an on stage cast of 4 it seems almost impossible that so much ground is covered by them only. For the first half we are indulged with the unknown story of Chrisipus who suffers at the hands of Oedipussy's future biological father King Laius, and which lends itself to an interesting predicament; whether in fact there was any fate sufficiently cheery for Oedipussy even without the Oracle’s prophecy were it to be that he were left with his biological parents. A great twist in the tale from the start. Whereas the second half focuses on the years after Oedipussy has been established in Thebes where we witness his inevitable downfall through the unravelling of his story. Each part is played with such idiosyncratic difference one could be easily forgiven for thinking there are at least a dozen roles and sandles filled throughout the performance by different people! This is helped no end by Lucy Bradridge's absolutely breathtaking costumes which manage to maintain a realism of the era in the form of, togas, chitons & armour; in contrast with the futuristic leotards, shoulder pads and platform shoes, bodysuits, shepherds cloaks and woollen pants with critter like sheep balls, Egyptian beards, hats and tunics, as well as the majestic and refined clothes of the Theben and Corninthian kings and queens. Within the diversity and believability of the roles, focal anchoring of stage structure, role of narrator and the dynamics between the actors 'in character' as themselves, and despite the variety and fast pace, it never feels at any point as though there is room to get lost as a viewer. It is wonderfully grounded in that sense, which has as much to do with the direction and writing as the phenomenal performances. The use of soliloquy interspersed throughout the play by each character allows the audience to break from the main performance and meet each one of them on a more personal level. The soliloquies are often humorously overheard or disturbed by others reinforcing the self deprecating nature of the show that we encountered at the start and which plays on the futility of the future - a major trope of the story. Stemming from the shared jokes between characters and audience are subtle references and punch lines which are interwoven with spontaneity and grace. Whether intended and planned or sometimes improvised they maintain the pace of underlying humour, lifting it to new levels just as you think its safe to take a breath and allow the mind a moment to rest – but no! There's always more! It almost perpetuates a state of adolescent rascality and expectation of laughter which fulfils its own prophecy every time. This orchestration by the director and creative team is a wonderfully strong way of keeping the audience on board and included throughout, which is needed due to the relentless pace and amount of material covered. Without this connection between the performers and audience a lesser team may not have managed such a feat for the length of the show. With a wealth of experience between them the cast some of whom may be familiar to viewers of BBC2's Hyperdrive deliver an incredibly strong and energetic performance. Every member of the cast has numerous intricacies that stand out but for me the diversity of role achieved by Toby Park was particularity breathtaking. As narrator he was a central figure and the glue of the story which was executed with precision alongside the many roles played and finally for his musical interludes which included playing flute, drum and alto saxophone. The tenacity of the cast for such a performance is admirable. Use of red plastic shapes strategically placed whenever injury occurs or blood is shed are a fabulous touch, and work as a deliberate detraction from the horror that could be, were this a dramatisation piece. The culmination of the show in the well known scene, where Oedipus claws out his eyes, is phenomenal and uses this device to overwhelming effect. With wonderfully attentive and acutely timed accuracy of the lighting (Phil Supple) and compositions (Neil Filby) throughout this mammoth show of changing landscapes and atmospheres, the minimalist backdrop is filled and brought together with great flair. Each of these aspects really finish off every satirical point and reference to maximum effect as seen by the choice of song to end the performance on, the Eels 'Its a Mother*****'. Whether well versed in the story of Oedipus the King, or a newcomer to the story, this adaptation is a delight and one to be savoured. If you can get to see it in Liverpool's wonderful Playhouse it plays until Saturday 17th March, elsewhere until 16th May - for details, click on this Spymonkey link.